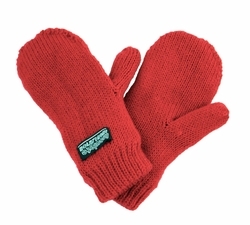 These Red knitted baby & toddler mittens, are specially designed to keep your child's hands warm in cold weather. Lined with 100% maximum thermal retention fleece. While these mittens are extremely warm, they are not waterproof. These thinsulate mittens are available in a range of sizes and colors. Knitted mittens are a winter necessity, they are must-haves for kids. The fleece lining will keep your child's hands warm.